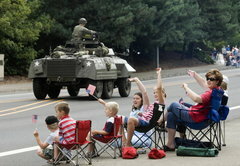 Local veterans groups organized a parade in Tigard in 2007 to welcome the Oregon Army National Guard’s 41st Infantry Brigade Combat Team back from Afghanistan. They’re doing it again Sept. 11 for soldiers returning from Iraq.Community members are invited to join local veterans groups in welcoming home the Headquarters Company of the 41st Infantry Brigade Combat Team (HHC, 41-IBCT). Located at the Tigard Armory facility, the Headquarters Company was part of the largest call up of Oregon military since World War II. Over 200 members of the Headquarters Company are in Iraq, supporting that deployment. Plans are being made for a Homecoming for the Headquarters Company and their families for Sept. 11, ( 9/11) with a parade starting from Tigard City Hall, followed by a Family Fair at Cook Park. Community groups are encouraged to join in the parade and help put on the family event. The parade route will follow Hall Boulevard to Tigard High School, turn right on Southwest Durham Road and then turn left to Cook Park. A similar homecoming event, done on August 4, 2007, after HHC, 41-IBCT returned from Afghanistan, started from Oregon 99W. Tigard American Legion Post 158 and Tualatin VFW Post 3452 have over 20 local members deployed with the brigade. If everything goes as planned, the entire Brigade is expected to begin returning to Fort Lewis, Wash. for out-processing in the second week of April. Out-processing is expected to take six days and will begin as groups arrive. This includes medical and mental evaluations and completion of paperwork to move these national guard members back to civilian life after more than a year of active duty status. There will be major ceremonies in Portland, Bend, Medford and Eugene/Springfield areas as the troops initially return to Oregon. The guard members will each be given 90 days to reintegrate back into civilian life (with their families, job, and/or school and their communities) before resuming military duties but will have the option to resume drilling with their unit earlier, whenever ready. The Headquarters Company homecoming will be held after the unit has reformed. We want the troops to know that we really appreciate their sacrifices. One of the best ways to communicate that thought is, when you greet a veteran; to firmly shake their hand. look directly into their eyes and say, “Thank you for your service”. They will know you mean it from your heart.